The pH Scale, learn to use this simple procedure. 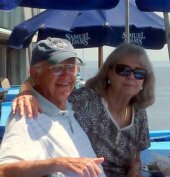 If you had asked me how I measured on the pH scale before I was diagnosed with prostate cancer, I would have had to tell you I haven't a clue as to what you are talking about. I vaguely remembered that pH may have had something to do with high school chemistry. Needless to say I had no idea how important the scale would be later in my life. Today, I have learned to use this simple procedure to tell if my body is healthy or if I am falling into the sickness mode. Knowing your pH is the most important measure you will use to stay healthy! This acid condition is caused by the foods that we eat and the excessive stress levels that the modern living creates. Diseases flourish in an acid environment. The human body is designed to be slightly alkaline instead of acid, although the body is acid by function (breathing, digestion, dealing with acid foods and drink). Some areas of the body have different pH values but the blood is the major indicator that tells the overall wellness of our bodies. We have 30 plus feet of digestive system that allows for a slow passage of food to extract nutrients that the body survives on. Plant based foods, which are mostly alkaline foods, are the principal ingredients that keep us healthy and work well in this slow moving human digestive system. Excessive consumption of animal products create an acid condition that may ultimately cause chronic diseases. Carnivores, such as lions and tigers, have a short digestive tract that is highly acidic to rapidly break down the flesh of it's prey and expel the waste quickly. We are different! "WE ARE DIGGING OUR GRAVES WITH OUR TEETH." Most of the world's cultures eat very minimal amounts of animal products and do not have the incidence of chronic diseases that Western Civilization does. As we have reviewed in "The China Study", when you consume more than 5% of your daily calorie intake in animal protein...chronic diseases start to creep in. The pH paper is the simplest and most inexpensive way to see if you are on the right track to excellent health. Click here for this wonderful product. 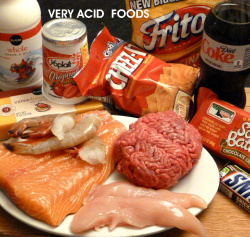 In the USA, our over all consumption of acid forming foods is heading us down the road to sickness and disease. Measuring your body's acidity/alkalinity by using the pH scale will give you a quick picture of your health, and assist you in making the right choices to achieve excellent health. The pH is a measure of acidity and alkalinity of a liquid by determining the concentration of dissolved Hydrogen ions. A low pH has a high concentration of Hydrogen ions while a high pH has a low concentration of ions. 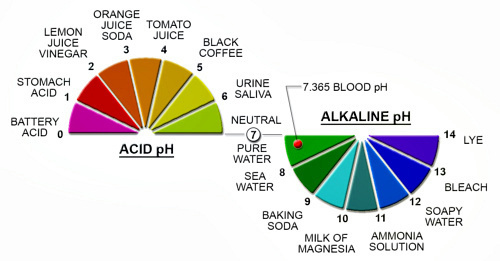 The pH scale is very simple...it is 0 - 14, with 0 - 7 being the acid side and 7 - 14 the alkaline or base scale. Pure water is said to be neutral at 7.0 on the scale. As the numbers increase or decrease from the neutral position of 7.0, the intensity of each segment multiplies by a factor of 10. You can now forget about all these fancy numbers and just remember that 0 - 7 is acid and 7 - 14 is base or alkaline. pH Balance in the Body - Diseases flourish in an acid environment. 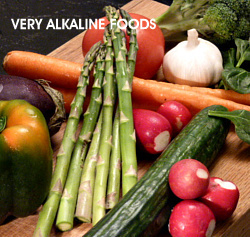 The human body is designed to be slightly alkaline.